Members of the Islamic Movement in Nigeria (IMN) today in Abuja staged a protest march at the Human Rights Commission (HRC) to demand the immediate release of their spiritual leader, Sheik Ibrahim El-Zakzaky, who has been in detention since December 2015. The Shi’ite leader has been held in custody since his followers clashed with the convoy of the Chief of Army Staff, Lieutenant-General Tukur Buratai, in Zaria, where the army chief was billed to attend the passing out parade of soldiers at the military depot. At the HRC today, armed policemen stationed in the area prevented the protesters from getting too close to the gate of the commission. A lecturer of Criminology at Bayero University, Dr. Memuna Useni, who spoke on behalf of the group, expressed displeasure over the flagrant disobedience of the rule of law by the government despite the court order by Justice Gabriel Kolawole which directed the immediate and unconditional release of El-Zakzaky from detention. She noted that the security agents have been holding the spiritual leader and his wife illegally despite his deteriorating health. She accused some people in the government who are abusing their power and supporting the violation of fundamental human rights, in effect subjecting the nation to the laws of the jungle. Dr. Useni expressed regret that hundreds of children have been orphaned and wives and husbands widowed, while others are languishing in illegal detention. 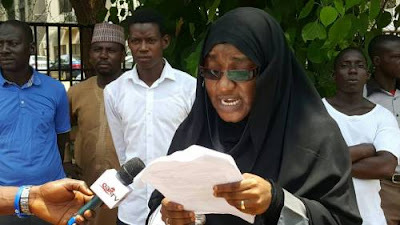 The group also appealed to Nigerians and the international community to prevail on the Federal Government to release unconditionally and without delay, the IMN leader and his wife, as well as other members of the group being held. The Shi’ite members have embarked on a series of protests to press home their demands. The group had accused the Nigerian Army of committing a massacre in Zaria, choosing not to investigate the genocide and allowing the perpetrators of the act to walk free.